Pull request Compare This branch is even with SF-WDI:master. Note: This is a pair programming activity! You must work with a partner on this project! There are many pieces that could trip you up, so having two pairs of eyes and two brains on one set of code will be an important tactic to minimize errors and generate ideas. In this training, we attempt to put together much of the work from this week. 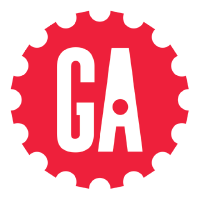 We'll be using jQuery's ajax() function to make calls to a third party API. We will be using live data from the USGS (United States Geological Survey), specifically a data set showing significant earthquakes (M4.0 or greater) from the past week. Get started with the code provided in index.html and scripts/app.js. List information about each quake. 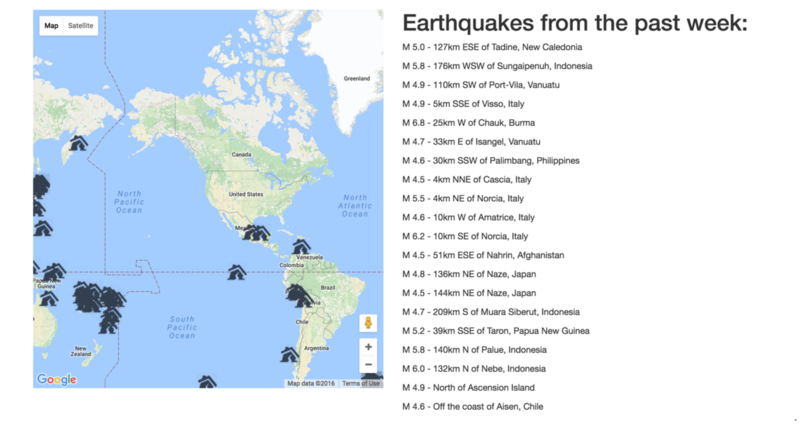 Display a Google Map with a pin at the epicenter of each quake. If your partner forked the repository originally, you should fork their repository after you finish working together so that you'll have your own copy of your work to edit in the future. Link your own repo to your personal website. Take a moment to familiarize yourself with the dataset by opening it in your browser: http://earthquake.usgs.gov/earthquakes/feed/v1.0/summary/significant_week.geojson. What is the structure of the data? How many earthquakes does it list? How would you grab the first earthquake? How would you grab its title? How many hours ago is that? Write out the AJAX call that will grab the data and console.log the list of earthquakes. Switch to Template Literals: We encourage you to use template liteals (with the `). At a certain point it's easier to work with a template than to build HTML strings by hand. Note also that the instructions given there involve creating an initMap callback function. We don't need one of those: you can put the code inside of their initMap function directly into your $(document).ready callback. NOTE: The proper implementation will entail writing your code for Google Maps integration in app.js only. There is no need to alter index.html as some resources may recommend. Once you've got the map to show up, your next goal is to drop a single pin on your city. This is a sanity check. Next, can you add only the first earthquake to the map? Can you add pins for all the earthquakes to the map? Finally, can you replace the pin with the earthquake.png icon? Calculate how long ago the quake occurred and add it to the page. E.g. "28 hours ago". Currently, the time that the API returns is in Unix time (seconds since 1/1/1970). That's a nice format for computers, but not a nice format for humans. Parse the title to only include the location, E.g. Instead of "M 4.2 - 1km ESE of Fontana, California", it should just say "Fontana, California." Create a visual indicator of the magnitude of a quake. For instance, maybe a 4.0 is indicated by a "yellow" dot, a 5.0 by an "orange" dot, and anything larger is "red". Create a button that allows us to switch the map from having a 'weekly' view to a 'monthly' view of all quakes. Hint: look through the USGS website to see available endpoints.